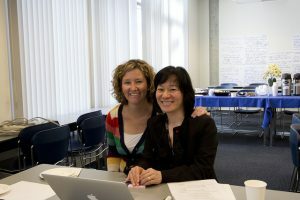 On March 31 and April 1, 2016, the BCcampus Open Education team brought together two faculty members, two librarians, and two instructional designers from across the province to co-develop an Adoption Workshop toolkit. A complete PPT slide deck (over 70 slides) that highlight the what, why and how of open education. The slide deck includes informative notes to provide context to each slide, and as you will see we have provided a few examples of each slide topic so the facilitator can choose the best slide given the audience. These slides are CC BY which means that all of the slides can be used, remixed, revised, and redistributed for your use at your institution. A one-page handout on How to Adopt an Open Textbook – this can be reused, revised, remixed, and redistributed. A one-page handout on OER Repositories which provides a listing of various repositories available to search for OER. Special thanks to Farhad Dastur (KPU), David Harper (UFV), Caroline Daniels (KPU), Inba Kehoe (UVIC), Gail Morong (TRU), and Lucas Wright (UBC) for being participants and co-developers at the two-day Adoption Workshop Sprint. If you are interested in having one of the developers above or a BCcampus Open Education team representative present at your institution, about adopting OER the Why, What, and How; we are more than happy to work with you to schedule a time that works best for you and your Institution. Want to find out more about adopting and adapting open educational resources? Join us for a 1.5-hour workshop at the Festival of Learning and learn how to adapt OER and open textbooks. This will be a hands-on workshop, please bring your laptop. The workshop will walk participants through the ways in which one can adapt open textbooks from our B.C. Open Textbook Collection. We will show participants how to adapt using three methods of adaptation and provide an opportunity for discussion on challenges, benefits, and lessons learned. This is session is limited to 40 participants so make sure you get there early to secure a seat. Register for the Festival of Learning.